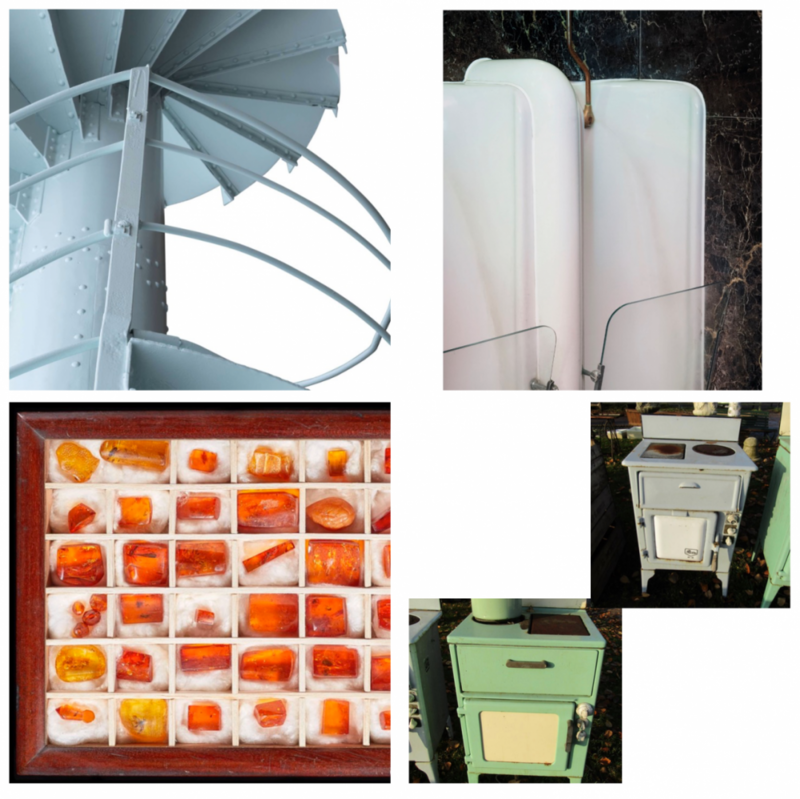 Paris (75), France - PARIS - On 27 November, during its traditional auction dedicated to Art Deco, Artcurial offered a segment (photo top left Artcurial) of the historic Eiffel Tower staircase. Measuring 4.3m high with 25 steps, it was a piece of the monument’s original spiral, dating from 1889, which linked the second and third floors. From a private collection in Canada, it was estimated at € 40,000 - 60,000. In 1983, the installation of a lift between the top two floors of the Eiffel Tower required the disassembly of a staircase which was cut into 24 sections, from 2 to 9 meters in height. One of them was kept on the first floor of the Tower and the other three were given to the Paris Orsay and La Villette museums, and the Museum of Iron History in Nancy. The 20 remaining sections were sold at auction and acquired by collectors worldwide. One is located in the Yoishii Foundation gardens in Yamanashi in Japan, another near the Statue of Liberty in New York and one in Disneyland. Others are located in private collections in particular in Switzerland, Italy or Canada. The section, from a private collection in Canada, sold for a four times estimate €176,150. In 2013, an original section measuring 3.5m high reached €220,000 including fees. In 2016, section n°13 of the stairs exceeded its estimate tenfold, reaching €523,800, the highest ever presented by the auction house. LONDON - On 20 November Christie's sold the fixtures and fittings from Annabel's nightlcub. Inevitably prices soared way above estimates. Of the architectural-related lots a George VI post-mounted postbox 'Carron Company Stirlingshire' sold for £6,000, a battered and repaired oak strip dance floor late 20thC estimated at £300 sold for £15,000, 10 brass wall lights by Philip Jebb c1963 £11,250 (est £2k), a Shanks multiple stall urinal with glass deflectors (photo top right Christie's) £3,250 (est £200), the modern 'Terrace Bar' in mahogany, brass and marble sold for £33,750 (est £2k). A 'quantity of wine racks and empty bottles' sold below estimate £1,000 (est £2k) 'Some racking labelled ‘Farrow & Jackson Ltd., London’, approximately 2000 sealed empty bottles, incomplete, to be dismantled for removal'. SUSSEX - Summers Place 240 lot 'Evolution' sale on 20th November included a collection of Baltic amber, every piece embedding traces of ancient insects. This collection was reputed to have been formed by Mr N. D. Derbyshire in the late 19th or early 20th century. A photograph of him and his wife was included in the lot, together with a quantity of illustrated notes identifying the insects in each piece of amber which were numbered. The collection of 50 pieces of Baltic amber, each with insect specimens, in a mahogany case 32cms by 21cms, sold for £5,800. The Baltic region is estimated to have more than 100,000 tons of amber created Eocene forests 44 million years ago, the era before pachyderms evolved. Although not a mineral, the fossilised resin is classified as a gemstone, and was secreted through epithelial cells of the often to protect the tree after storm damage. Due to its sticky nature insects then became trapped in the resin. Top lot at the sale was a fairly large Siberian mammoth skeleton from the Tomsk region which made £115,000. Mammoths survived in many places until 10,000 years ago and on remote islands in the Bering Straits mammoths lived on until around 2,000 years BC. An articulated skeleton of a Moa from before the 15th century, 1.4m high originally from New Zealand, sold for £22,000. The last moa sold at auction in Britain in the 1930s and it is unlikely that one will be offered again, according to the catalogue. Several different kinds of Moa are recognized and this particular example comes from a bird that belongs to the genus Pachyornis. Rather like an Emu in overall shape these creatures dominated the New Zealand landscape until the coming of man around a thousand years ago. The Moas of New Zealand are among the most famous of all extinct creatures. Some moas were over 4m tall. NORFOLK - Gaze had two sales of interest - the rural and domestic bygones sale and a modern design sale. There were two electric stoves from the 1940s, an apple green and cream enamelled 'Jackson' and a grey and white 'Revo R-8' 5.6kw, both with two hotplates, one rectangular and one circular, an oven, and a fold-down door to a grill. Jackson Electric Stove Co, of Luton, was formed in 1914 making stoves and electric kettles until 1958 when it was bought by Radiation Ltd. Revo Electric Co, of Tipton, made stoves from 1937-56 when it was acquired by Duport, another Tipton company. The Jackson sold for £70 and the Revo for £40. Other bygones included a c1900s white ceramic milk pail transfer-printed 'Pure Milk' with two cows, cracked,12ins dia 10ins high, sold at £480; four iron coal-hole covers c1850s one with 'W Harmer & Son' probably William Henry Harmer recorded as an ironfounder in New Road Rotherhithe, two with 10 point star hatching and one diamond hatched c1880 sold for £80; to trap was a Harry Carne patent hare trap by J Williams & Sons sold for £600; one of the top signs was white on red 'Drink CAMP It's the best!' 40ins by 30ins £320; top tool was a five-tine eel gleave at £70. In the modern sale a Danish six tier aluminium pendant lamp in the Poulsen style sold for £190, a Danish teak twin bed which could be used either as a double or two singles with floating bedside drawers sold for £440, a 1960s laminated bent ply dining table, circular top with four chairs after Alvar Aalto, 92cm dia 75cm high made £420. LONDON - Wellers held a closing down sale for Aladdins Cave at which the top lot was a traditional Georgian style white and green marble chimneypiece, greek key frieze, green marble columns, egg and dart architrave etc etc which sold for £2,600 hammer. SUSSEX - SPAB has published a handy pdf booklet all about Horsham Stone Slate. The booklet is generally supportive of reuse, but less so the trade in reclaimed Horsham stone slates where it states, 'The group broadly agreed that reliance on salvaged stone could undermine any push to find and open new HSS delves. Anecdotally, it was difficult to secure supplies which were known to have been acquired ethically and were of clear provenance. There was a widespread concern that the market for salvage also drove architectural theft and unauthorised work to old buildings, and might encourage unnecessary or unjustified demolitions. Parallel concern was expressed that there were probably buildings of listable quality with HSS roofs that had not yet been identified for designation / protection, and that humbler buildings were still at risk of losing their HSS roofs to supply materials to other buildings. Some of those who had worked with salvaged material indicated that it was often of variable or poor quality and that, where provenance was unclear, it could be used wrongly (e.g. material salvaged from a north slope could be used on a south slope, or vice versa, with implications for the longevity of the repair).' Provenance is key. EDINBURGH - Holyrood Architectural Salvage has a simple fire surround made from the enigmatic St Anne's marble. This material can come from several locations including St Anne's in Belgium and the French Pyrenees. 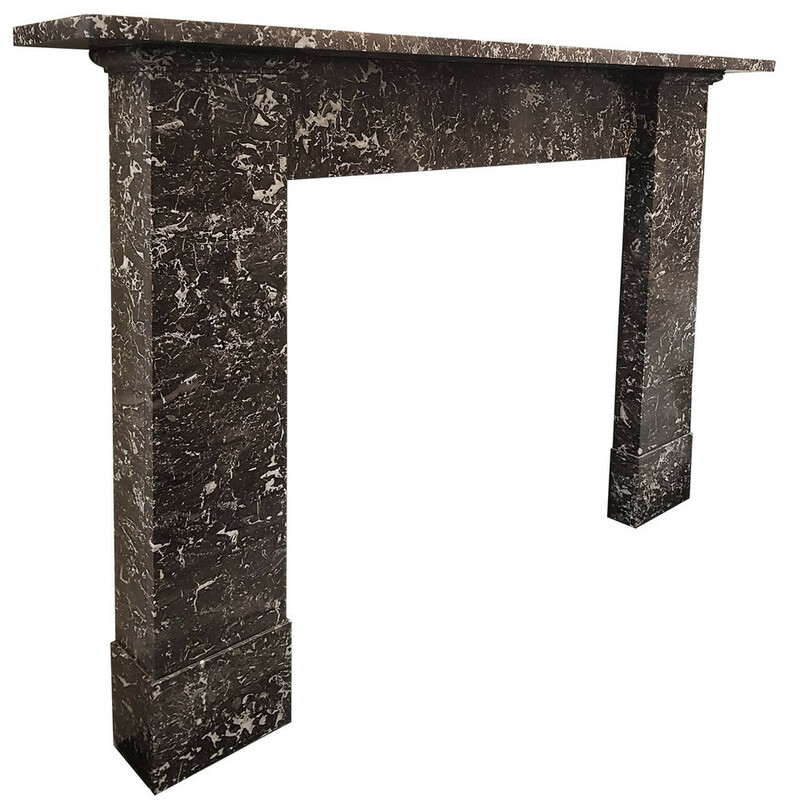 The classic St Anne's is a black or grey true marble with white flecks, but in Britain it can also be a polishable black reef limestone with small cavities filled by white calcite which was quarried in Mitchelstown County Cork in Victorian Ireland. See the fireplace here: holyroodsalvage.com/antiquefireplaces/saint-anne-marble-mantel-1516? BIRMINGHAM - Get your web page to the top? Dixon Jones of Majestic-12 Ltd has written a blog post about Google's algorithms entitled 'How PageRank Really Works: Understanding Google'. He writes, 'Whilst on holiday this summer, a Mathematics teacher approached me in a restaurant and asked me to explain the PageRank formula on my T-Shirt – which is really the key to understanding Google’s algorithms. It made me think and create the best explanation of PageRank that I can find. Hopefully better than the others I have seen on Youtube.' The only prob? Once team google see this they will tweak their algorithms yet again, as they do this roughly once a day anyway. SHROPSHIRE - Jackfield has the widest level crossing in England. This crossing is on the former Kidderminster to Shrewsbury railway line passing through the Ironbridge Gorge. This section of railway is now closed and the track lifted, but crossing gates remain and are reputed to be the widest in Britain at 38 feet for a single gate. The gates are hung on circular cast iron gate-posts supporting high-braced wooden gates on large strap hinges. The Shropshire Star writes that, 'the timber from the gates is of little structural value, hence the need to replace them, however, there are some really interesting shapes and textures in the wood of the existing gates and we are interested to see what the art and craft community of the Gorge can make of them. It would be nice if pieces of this version of the gates are able to live on as art pieces, benches, tables, turned bowls, etc. Ideally, each person entering the challenge would offer something back to the community, as the gates have been part of the Jackfield community for 150 years, it will be good to see them living on in some new form. If anyone wishes to get involved with the event, or has questions, please contact office@smallwoods.org.uk. EASTER ISLAND - The eight-foot-tall Moai sculpture at the British Museum is called Hoa Hakananai’a, which translates to 'the stolen hidden friend'. The four-ton statue was taken/stolen from the island in 1868 by Royal Navy captain Richard Powell, and presented as a gift to Queen Victoria. She donated it to the national museum in London in 1869. Now the Rapa Nui people of Easter Island would like their statue returned because they consider it an object of sacred worship, believed to house the spirit or mana of the depicted deity. Easter Island’s Ma’u Henna community, with support from the Chilean government, has offered to swap out the original piece at the British Museum for a replica. They have partnered with Hawaii’s largest museum, the Bishop Museum, to produce the copy, employing modern technology and thousand-year-old Rapa Nui techniques. “Our expert carvers will make a copy in basalt, the original stone used in the Hakananai’a moai, as an offering to Queen Elizabeth in exchange for the original,” Camilo Rapu, president of Ma’u Henua community, told reporters in Santiago. A British Museum spokesperson said the museum is one of the world’s leading lenders and that the Trustees will always consider loan requests. BERLIN - Marwitz: An old iron and wood sleigh at Historische Bauelemente was described as a 'Royal Sleigh' and dated c1880 (although it looks earlier), was for sale at €2,950 but has now been sold. 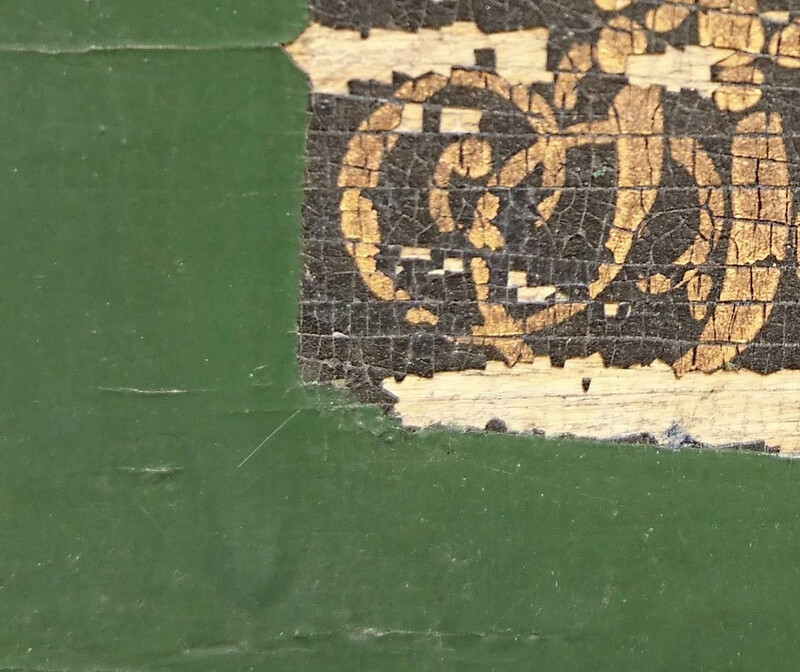 Apart from it looking the business, underneath the more recent green paintwork a patch was left by the monogram which shows the original colours. Germany was the chemical manufacturer of Europe in the late 19th century, and by 1914 was estimated to supply 90% - and that included paint. Carriages were traditionally painted black, made from wood or coal tars, which were very durable. The same paints were used on ships and buildings. Indeed, Henry Ford's famous assertion that customers could have any colour they wanted provided it was black, came after several years of paint trials and the realisation that black paint was the most durable colour. The paintwork on this sleigh was originally black - which although crazed can still be seen adhering well to the substrate in the area around the monogram. The craze for less durable white-painted woodwork in middle class houses came in around 1900-1910 when the new German white paints were introduced, supported by painters who were happy to repaint the white every few years, instead of black once in a lifetime.